It’s an interesting concept. You meet someone, get to know them, and at some point, determine that this is a person you want to form a relationship with. I’m talking about romantic relationships, of course, but what I’m about to discuss can also be applied when thinking about friendships, co-workers and even sometimes, family. We all start out as strangers. Something along the line then brings us together; whether it’s friends, family, work, other strangers, something brings us to the point of wanting to become connected. These connections, I think depending on your personal beliefs, can be fate or they can be by chance. Personally, I think we meet who we’re supposed to. They teach us what we’re supposed to learn and they either remain in our lives, or we are destined to be apart… to become strangers. In a discussion with a close friend recently we discussed this. She had been in an on-and-off again relationship with someone she had cared about for a long time, and at one point, the relationship ended. Both tried to make it float, but fate jumped in and proved it couldn’t work. Recently, she heard of this person, years later, being in the same city as her, only a block away, and immediately questions of ‘is this fate’ and ‘what does this mean’ came to mind for her. Incredibly happy in a current relationship, guilt set in for her. Why and I thinking these things? ; What do these thoughts mean? ; I know I don’t care about this person anymore, why am I over thinking this? My instant response: It’s OKAY and you’re human. 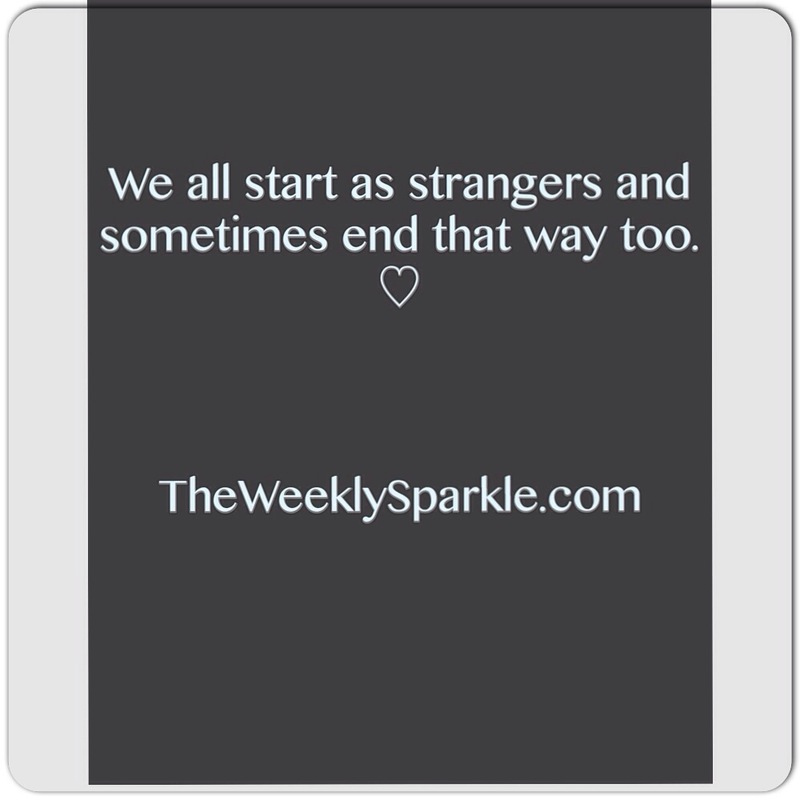 It’s an unfortunate cycle sometimes, but often, we start out as strangers with some people and end as strangers. You will always remember the great times you had, what built your relationship etc, and our natural human-like instinct will be to go to those memories and wonder what if? Intense relationships have a habit of making us second guess, and that’s okay, as long as you’re able to pull yourself from those thoughts and remain current. These people become strangers once again, and the moments and memories you have, no longer dictate the kind of person they might be. I say this applies to other relationships, because it does. I’ve recently ended two big friendships in my life, and while I never could have seen it happening, I often remind myself that I’m better off because of it. These two people, have become strangers. My friends ex boyfriend, a stranger. Your freeze-frame of what your relationship was is no longer. They have changed, you have changed, and what was might not ever be again. And I say again, that’s OKAY. I think it’s human nature to want relationships to last, to fight for the ones we care about and to try and salvage the great moments we once had. I think the point of this post is the support you and remind you that it OKAY to move on from relationships that no longer serve you and help you grow. And in the moments where you feel weak, or wonder, don’t feel guilty. Sometimes people come in to our lives to teach us lessons, give us love, guidance, whatever it is we need, and then they are destined to move on without us. We are destined to move on, without them. Move. 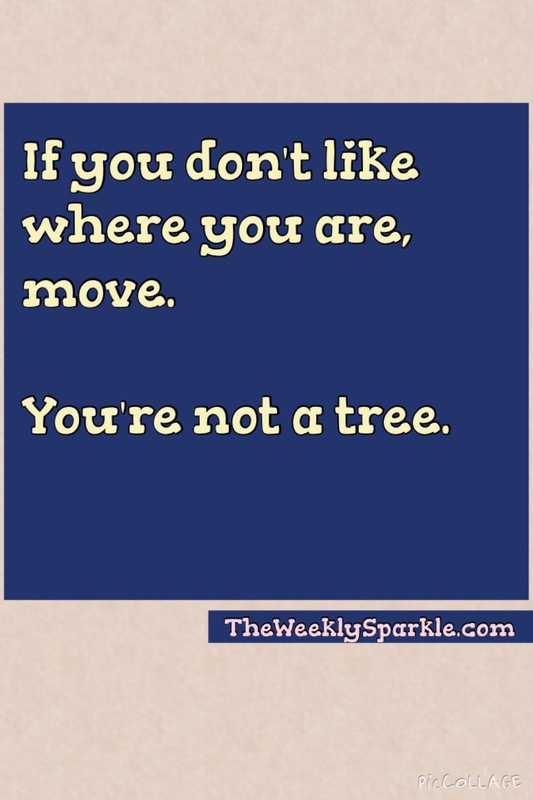 You’re Not A Tree. What a quick reminder of reality. Sometimes we think we’re stuck in a situation or worry about circumstances, and don’t realize that they are just that- situations and circumstances. Too often, I think we forgot that have have power over both of these things in all aspects of our lives. This sits most recently with me, as I’ve come to the realization that things I am currently unhappy with, can change… and that I have the power to make that happen, when I want. That’s the key to getting what you want, deserve, are looking for… you make it happen by flipping the switch. Do you want to lose weight/create healthier habits? Are you in a relationship that you feel you shouldn’t be? At a job where you know you need to try something new? Or maybe you’re looking to start a relationship, get on the dating scene, or take up a new hobby- YOU have the power to jump-start all of these things and to make them happen for yourself-NOW. That’s what this means… YOU, ARE NOT, A TREE. The only thing rooting you down is yourself. The things you want to change, can change, you just have to hit the start button.